A curated "one-stop-shop" designed with the needs of the MIR traveler in mind, the MIR Corporation Travel Gear Shop offers a unique collection of apparel and gear that best helps you prepare for, and enjoy, your MIR adventure. You'll find top performing brands such as Outdoor Research, Patagonia, Eagle Creek, Tilley, and others that feature items that are sun-protective, lightweight, easy-packing, waterproof, windproof, moisture wicking, quick drying, insulating — everything you need them to be. 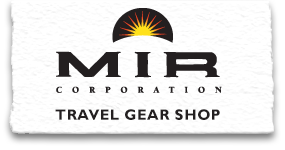 The MIR Corporation Travel Gear Shop is operated by our gear partner, New Headings. To begin shopping, simply click on any of the categories you see or call New Headings toll-free at 1.888.924.2050 for personalized customer service. Just ask for Peggy, Marcy, or Mark. As part of our commitment to benefit and protect our favorite places, MIR Corporation will donate all profits from the sale of our gear towards cultural and conservation projects we support. See the projects we have supported on our website. We wish you safe, frequent, fun and well-equipped travels.